1) The paper of the month presents a concept for Sustainable Land Management to secure a long term successful development of informal urbanization. To create good conditions for improving the property and planning situation, a solid legal base has to be put in place before further land management activities are undertaken. The author asks for the initialization of an intermediate legal frame-work as an initial step to be applied to a special perimeter of action, the so-called 'temporary development zones' TDZ. This paper was presented at the Annual World bank Conference on Land and Poverty, in Washington DC, April 8-1, 2013. You can hear Dr. Alexander Kohlis presentation at the XXV International FIG Congress 2014 in Kuala Lumpur, Malaysia. Key words: Urban expansion, land management, fast documentation, spatial planning, temporary development zones. In metropolitan areas the informal urbanization of the outskirts is a classic practice. Today it must be accepted that a large number of the regulatory tools available for managing urban development are not necessarily appropriate to be applied as they are in many developing and transitional countries where the rule of law leaves a lot to be desired. In consequence, the large majority of urban authorities often do not engage in realistic preparations for growth. The two known approaches in this field, the set-up of regulatory measures on the one hand and the public initiatives on the other, are commonly accepted but do not necessarily lead to success. Looking at the initiatives approach it becomes clear that the need for a sufficiently consolidated property system to gain long term success is underestimated. A formally correct situation without conflicting property rights and disputed land titles remains a pre-condition not only for enabling land and housing markets but also in view of securing land for public needs, assuring sites and services in the framework of public initiatives (Sustainable Land Management). To create good conditions for improving the property and planning situation, a solid legal base has to be put in place before further land management activities are undertaken. The presented concept, therefore, asks for the initialization of an intermediate legal frame-work as an initial step to be applied to a special perimeter of action, the so-called 'temporary development zones' TDZ. In metropolitan areas of southern, transitional, or post-conflict countries, the informal urbanization of the outskirts is a classic event. Today it must be accepted that a large number, if not most, of the regulatory tools available for managing urban development in industrialized countries are not necessarily appropriate in many southern and transitional countries. Where the rule of law leaves a lot to be desired, where property rights are not strictly enforced, where land registration and cadastre are incomplete, where officially-sanctioned city plans are rarely available or taken seriously, where much land subdivision and construction happen without permits, where enforcement is intermittent and often corrupt, and where a large part of the citizenry cannot afford minimum standard shelter, new approaches are needed. The large majority of urban authorities in developing countries do not in consequence often engage in realistic minimal preparations for growth. It is essential to secure the necessary public lands and public rights-of-way necessary to serve future urban growth, protect sensitive lands from building, and invest in minimal infrastructure—transport grids, water supply, or sewerage and drainage networks—to accommodate growth that is coherent. Instead, the authorities some-times focus on ambitious utopian master plans that are never meant to guide development on the ground, take many years to complete, and are usually shelved shortly after their publication. At other times, they simply refuse even minimal planning and investment, hoping against hope that their overcrowded cities will stop growing. Even many plans developed with the assistance of donors have neither been endorsed nor institutionalized. Needless to say, it is more expensive to provide trunk urban infrastructure in built-up areas—especially in areas developed by the informal sector—than to provide such services, or at least to protect the right-of-way needed for such services, before building takes place. The absence of even minimal preparation for urban expansion–on both the activist and the regulatory fronts–is, no doubt, an inefficient, inequitable and unsustainable practice, imposing great economic and environmental costs on societies that can ill afford them. For all of these (bad) examples of urban expansion caused by sprawl and informal/illegal housing and dwellings, modern concepts of sustainable management are urgently needed. The two known approaches in this field, the set-up of regulatory measures on the one hand and the public initiatives on the other, are commonly accepted but do not necessarily lead to success. Looking at the initiatives approach it becomes clear that the need for sufficiently consolidated property systems to gain long-term success is underestimated. A formally correct situation without conflicting property rights and disputed land titles remains a pre-condition not only for enabling land and housing markets but also for public initiatives in the sense of securing land for public needs assuring sites and services. Sustainable land management (SLM) using urban planning instruments and master plans can reasonably take place to allocate zones or plots for trade, industry, and housing as well as for public sites having a formally clear situation concerning property only. To create good conditions for improving the property and planning situation a solid legal base has to be put in place before further land management activities are undertaken. The key question remains: How can land management be implemented in a dynamic envi-ronment taking into account economic development, the need for increasing food and fiber production, as well as preserving production capabilities and preventing land degradation? How to plan and manage all uses of land in an integrated manner such that land management becomes sustainable and supports wellbeing and good governance? The following findings can be stated as assertions. Statement 1: Economic development consumes land. Statement 2: (Sub-)Urban development sprawls on agricultural land. Statement 3: Land consumption and sprawl cannot be stopped but can be guided and controlled. Statement 4: Guidance of land consumption and SLM creates better conditions for de-velopment. Statement 5: SLM needs a cadastre as a pre-requisite. Statement 6: Resolution of informal squatter area problems requires the establishment of 'temporary development zones' with special legal provisions. As a basic rule it must be accepted that economic growth leads to the demand for land. This happens in agricultural-based as well as industrial economies. By 2009 economic growth in Switzerland resulted in one square metre of land (agricultural ~) being consumed by streets and buildings every second. With a well defined and permanently monitored land use plan-ning system in place the consumption of land could not be hampered. Several towns had to integrate formerly independent villages as suburbs. Equal results can be found in the megacity of Baku, Azerbaijan, and Accra, Ghana. There developments combined with migration from the land produced a phenomenal construction boom (Figure 2-1). 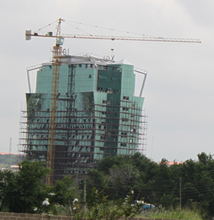 Figure 2-1 Construction activity in Azerbaijan (2008, left) and Ghana, Accra (2011, right). On all continents, a relative decline in average urban growth rates has been observed for the last 20 or 30 years, compared to those of the preceding decades. This declining trend in demographic growth becomes more obvious if fixed perimeters are used, as a general process of spatial expansion is being seen everywhere. The advancement of urban sprawl along communication routes often precedes the type of sprawl where the empty areas are filled. Aside from these general forms of urban sprawl, the patterns of peripheral expansion turn out to be varied in terms of type of housing conditions, population pattern, means of protecting structures, construction, and social categories. Despite geographical, socio-cultural and political situations differing greatly from one metropolitan area to another, the processes of urban expansion are similar. In metropolitan areas of developing or post-conflict countries, the informal urbanization of the outskirts is a classic working-class practice. This happens in the form of clandestine housing developments that fail to comply with the planning regulations, or in the form of illegal occupation of sites without the owners’ consent, with inhabitants constructing their own, often precarious, dwellings. This illegal occupation (e.g. 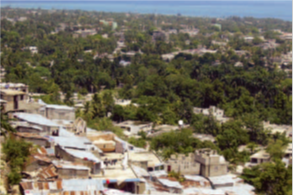 Kosovo (UNCESCR 2008), invasiones in Latin America, squats or squatter settlements in Asia, campements in Africa, urbanisation sauvage in Haiti) develops preferentially on available sites on the city’s outskirts, often un-suitable for habitation. It may equally occur within gaps in the urban area, including in central or pericentral zones. 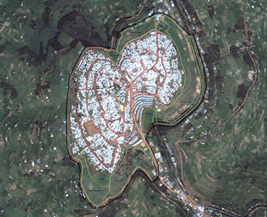 Figure 3-1 Sprawl as a planned development for IDP’s Gardabani near Gori, Georgia (left) or Gihembe IDP camp, Rwanda (right). Sprawl may also result from planned development, as demonstrated by detached housing developments and other residential programs produced by the capital investment sector or con-trolled by the public sector. Some projects may be on a very large scale: new districts corresponding to satellite sub-cities in Delhi, huge metropolitan projects in Bangkok, edge cities in Cairo, resettlements of IDP’s in Ramana (Baku, Azerbaijan), Gardabani (Gori, Georgia, Fig-ure 3-1), or Gihembe (Rwanda, Figure 3-1), etc. The sustainable treatment of land as a finite resource today is a mayor goal of space-oriented activities. Against the background and the requirements of a growing population, the World Bank (2006) defined its SLM as a knowledge-based procedure that helps integrate land, water, biodiversity, and environmental management to meet rising food and fiber demands. This should be achieved through sustaining ecosystem services1 and livelihoods. This definition is focused mainly on agriculture and rural development. When it comes to urbanized areas the water, environmental, and biodiversity aspects may take priority. Bearing in mind Prud’homme et al. (2004) the city itself, based on its economic role as a fly-wheel, is the moving force for sprawl. The pressure to repopulate or manage the outskirts problems by legally approved zoning is mainly dependant on sanitation needs and economic reasons, as mentioned above. These processes are guided by risk-based land use planning or prioritized public interest. In non-industrial countries economic pressure often is overwhelm-ing and dynamic so even guidance and control do not happen if the relevant instruments are not in place (UN Habitat 2010). Land consumption, however, declines right away if the econ-omy shows signs of weakness. Direction is successful especially if there is danger to be avoided by risk-based land use planning measures. Hazardous areas such as floodplains, mud/land and snow slide areas, etc. (Figure 4-1), are not suitable conditions for housing (Kohli, A. 1999). Even belated identification can be the reason for resettlement or restricted areas. In such cases active land use planning becomes SLM and is an asset for the community by increasing security of life and of investments as well (Kohli, A., et al. 2001). 1Ecosystem services are the benefits people obtain from ecosystems. These include: - Provisioning services that provide necessities such as food, water, timber, and fiber; - Regulating services that affect climate, floods, disease, wastes, and water quality; - Cultural services that provide recreational, aesthetic, and spiritual benefits; - Supporting services such as soil for-mation, photosynthesis, and nutrient cycling (UNEP 2005). 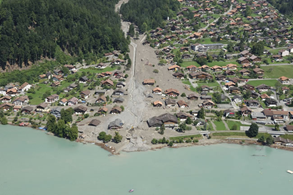 Figure 4-1 Debris flow in the Bernese Alps, municipality of Brienz (2005, left), Switzerland and dwellers settle-ment in Port-au-Prince built on a landslide prone area, Haiti (2010, right, Photo © Ä. Forsman, UN Habitat). By applying strong SLM procedures, including transparent land consolidation methods to rural and urbanized areas, amongst other things, investments in utilities become highly worthwhile and create more favorable effects than in sprawled areas. Efficiency rates increase and network planning for water or sewage makes sense. Housing and industrial site developments as well may profit from available and easily connected utilities, as these effects can be realized by first agglomerating construction in abandoned areas, industrial wasteland, or gaps in settlements. A higher density of users creates better conditions as overall costs for citizens and capital investors decrease and service quality may increase. 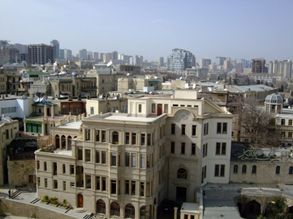 In Azerbaijan, especially in Baku (Figure 5-1), continuing degradation of the urban environment is going on due to the lack of a modern spatial planning system, missing master plans, or absence of detailed plans for urban areas. Consequently, new construction is carried out under the pressure of market forces, basically without proper planning regulations. Even forced eviction for town development is common. In addition it is not quite clear who is responsible for the preparation of plans and issuing of permissions for changes in land-use as well as for building permits. State planning authorities still try to oversee planning issues that might be handled at the regional or municipal level (UNECE, Committee on Housing and Land Management 2007). Easy to apply building permits would help to increase security of the property. Stable and transparent procedures with defined planning horizons create security amongst owners and a readiness for dynamic developments — all factors for the well-being of a developing and an industrial community. 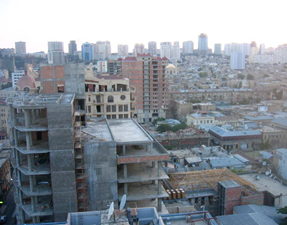 Figure 5-1 Urban construction projects in Baku, Azerbaijan (2008, left), and urban development with evictions in Borei Keila, Cambodia (2012, right). Land management needs (in land reform, land consolidation, land use planning, etc.) as a pre-condition a sustainable base documentation of topology, topography, and property ownership or tenure. 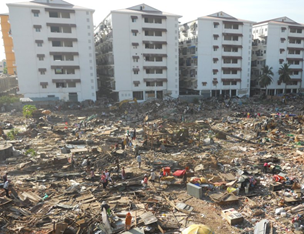 In cases where a reliable cadastre is missing, property issues remain unclear and SLM is hampered (The World Bank 2009). So in the immediate aftermath of a conflict the securing, restoration, or setup of land records is crucial. The cadastre follows as a consequence of where land records are available (Augustinus, C., et al. 2007). Bad examples are easy to find, such as in Kosovo (Andersson, B., et. al. 2003) or other Balkan countries. Even if a form of a cadastre system is in place but is unreliable and poorly maintained an unclear property situation makes SLM very difficult, as shown above in Azerbaijan. Loss of property and investments because of a lack of transparency in public planning and an unreliable cadastre will cause distrust in cadastral documentation. Problems will be created by illegal development and construction in restricted or endangered areas. 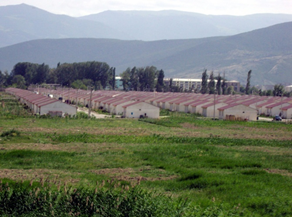 Since 2007 in Kosovo state and municipal authorities have tried to regularize and legalize illegal constructions as a first step back to reliable land management systems as the cadastre (UNCESCR 2008). Recently the call for new tools has been heard. FIG is starting new initiatives as manifested in the publication Social Tenure Domain Model (STDM) (Lemmen, Chr. 2010). Unfortunately the data model achieved under this initiative is even more complicated than others. A more promising solution is the simplified application of the Cadastre 2014 approach concentrating on the registration of independent topics for the actual state of tenures, properties or holdings (Figure 6-1). No surveying is required but only the identification of property or tenure based on points, poly-lines, or surfaces is needed. Efforts can be focused on the time consuming definition for regularization and legalization of informal and illegal tenures. Figure 6-1 Cadastre 2014 data model approach for easy and fast registration of tenures and holdings besides legal boundaries. Step 1: Identification of property, house, or tenure on satellite or ortho-photo maps as point objects to create a preliminary land title. Definition of a surface description on a separate cadastre layer in the GIS by poly-lines accepting overlapping claims, rights, and disputes. The latter shall have a topological link to the point object forming the land title. The cadastre information ob-tained in such a way shall reflect the actual situation should it be legally approved or based on customary possession. It serves as a working base and needs stepwise improvement. Step 2: Definition of procedures to formalize tenures based on clear documentation of spatial information. The procedures have to end up in a legally approved situation. Step 3: Further steps focus on the resolution of conflicts and approval of the property and tenure situation reflected by the cadastre. As a very easy and effective procedure the negotiation and reciprocal signing of (ortho-)photo maps by the owners or holders shall be used. After this a general public display of the resulting cadastral documentation may lead to public approval. Step 4: Having clear documentation of the actual situation in the cadastre, the communal and state driven processes of formalization of ownership or holdings can start by legally approved land reform acts. Figure 6-2 Fast Approach Cadastre Documentation to achieve basis for resolving pending land conflicts. To overcome the dodgy situation of sprawl combined with informal/illegal housing and dwellings, a joint approach of land consolidation and urban planning under special right is recommended. This concept asks for the initialization of a legal framework dedicated to the development task as an initial step applying to a separate perimeter of action–so called 'temporary development zones'. From several experiences we learnt that the adjustment of the legal framework has to take place before any action of master- and urban-planning, land rights documentation (cadastre) or regularization action is started. In doing so the regulations by existing law concerning several fields as civil code, real estate registration law, cadastre law, land use law, land reform and privatization law, etc., are arranged and completed to a rule set (Table 7-1) adapted to the development task under a Governmental Decree on the Establishment of Temporary Development Zones (TDZ). This rule set overrides the existing laws mentioned above in specific aspects. Table 7-1 Legal aspects to be ruled for Temporary Development Zones. Civil Code, Real Estate Registration Law, Cadastre Law: Changes to land parcels as well as to rights (encumbrances) are applicable within TDZ and are registered free of charge to the new owners. Compensa-tion by the TDZ project. Land Use Law: The land use within TDZ can be changed as technically accountable. Land Reform Law, Privatization Law: Land allocations may be freely changed within TDZ. Expropriation Law: Land expropriation against appropriate compensation is applicable within TDZ. Building Law: New constructions are permitted and registered free of charge to the new owners. Compensation by the TDZ project. Public Services Law: Public utilities are forced to provide services and metering to TDZ under appropriate conditions. Step 1: Definition of the perimeter of action (dwelling area to be developed) includ-ing sufficient compensation in adjacent area or in the near surroundings. Step 2: Common agreement and decision on TDZ: The assembly of stakeholders and local government shall make a decision on the establishment of special rights for TDZ based on the Governmental Decree on the Establishment of Temporary Development Zones (TDZ) for a defined project period. Step 3: TDZ Project Analysis Phase: Documentation of formal/informal land rights, and public demand (services, rights-of-way, sensitive and endangered lands). Step 5: Registration of new ownership; payments of compensation. Step 6: Reconstruction of settlements by private and utilities by public entities. Easy and free of charge registration for new ownership and building under concurrent compensation for registration by the TDZ project. The logical consequence of economic development—the inevitable consumption of land—substantiates the need for sustainable land management and cadastre. 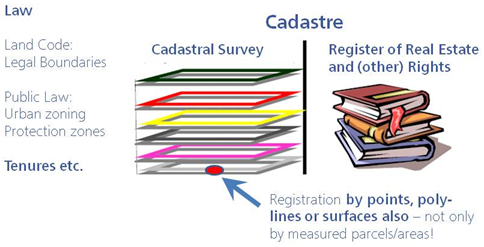 Successful attempts to direct or manage land consumption or land use can only be accomplished with the solid base of a well-maintained digital cadastre following the Cadastre 2014 principles, which represent the actual situation of property and tenure holdings (fast approach cadastre). The flexibility of handling not only legally approved but also informal and temporary objects through the use of the independent layer technology leads to an easy adjustment of documentation systems to meet the needs for the resolution of land problems. The sustainable resolution in terms of SLM for squatter and occupation problems asks for joint approaches of land consolidation and urban planning under special right. The instrument of 'TEMPORARY DEVELOPMENT ZONES' is based on a rule set adapted to the development task under Governmental Decree overruling the relevant land related laws. This enables a combined implementation of regularization of informal/illegal property situations and considerable improvements of services as well as sound legal protection of housing. However, the approach presented can only work if the Governmental Decree is put in force before project implementation will happen and the government allocates substantial funds for compensation. Andersson, B., Meha, M. 2003, Land Administration in Kosovo – Practice in Cooperation and Coordination, UN/ECE-WPLA and FIG Com3 & Com7 Workshop on Spatial Infor-mation Management (SIM) for Sustainable Real Estate Market 2003, Athens, Greece. Government of the Republic of Kosovo, Ministry of Public Services 2008, Summary of Find-ings of the KCA Functional Review, Functional Review and Institutional Design of Minis-tries (FRIDOM) Project, Pristina, Kosovo. Kaufmann, J., Steudler, D. with Working Group 7.1 FIG Commission 7 1998, Cadastre 2014, A Vision for A Future Cadastral System, FIG Booklet, http://www.swisstopo.ch/fig-wg71/cad2014.htm. Kohli, A. 1999, Measures to Prevent Scouring of Structures in Floodplains, Wasser & Boden, 51/3, 40-45 (in German). Kohli, A. 2004, Reconstruction of a GIS-Cadastre in a developing Country, GeoSpatial World 2004 Congress, INTERGRAPH, Miami Beach, Florida, USA. Kohli, A., Hager, W.H. 2001, Building Scour in Floodplains, Proceedings of the Institution of Civil Engineers: Water and Maritime Engineering 148, Issue 2, 61-80. Lemmen, Chr. 2010, The Social Tenure Domain Model – A Pro-Poor Land Tool, FIG – GLTN – UN-HABITAT, International Federation of Surveyors (FIG) Copenhagen, Den-mark. Prud'homme, R., Dupuy, G. and Boret, D. 2004, The New Constraints of Urban Development, Institut Veolia Environnement, Report n°1, Paris, France. UNECE-Committee on Housing and Land Management 2007, Land Administration Review: Azerbaijan, Programme of Work 2008-2009, Geneva, Switzerland. UN-HABITAT 2010, Strategic Citywide Spatial Planning: A situational analysis of metro-politan Port-au-Prince, Haiti, Summary Report, Nairobi, Kenya. Dr. Alexander Kohli, born in 1967, graduated from the Department for Rural Engineering and Surveying in 1995 at the Swiss Federal Institute of Technology (ETH Zurich). From 1995 until 1998 he was doing his PhD studies at the Versuchsanstalt für Wasserbau (VAW), Swiss Federal Institute of Technology (ETH Zurich) on BUILDING SCOUR IN FLOOD PLAINS. After the PhD in 1998, in 1999 he earned the Swiss license for licensed land surveyors. With BSB + Partner he runs a special department for Consulting and Development working for public (World Bank, EBRD, Swiss Government) and private organizations in the fields of Project Development, Land Management, Administration and Cadastre worldwide. In 2009 Dr. Alexander Kohli was dispatched as the delegate of the Swiss professional organi-zation of surveyors in FIG to Commission 8, Spatial Planning and Development. Since 2012 Dr. Kohli acts as Vice-President of the SWISS LAND MANAGEMENT foundation.